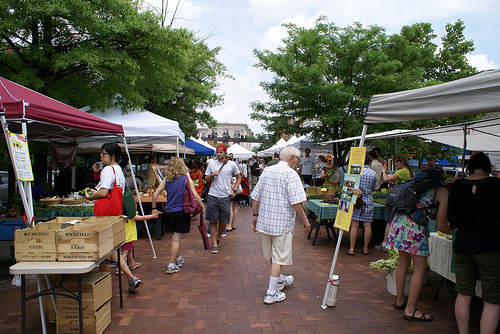 A farmers' market in the Mount Pleasant neighborhood of Washington, DC attracts a mostly white crowd. This neighborhood was once an upper-class white area, but white flight led to a shift to a lower-class African American, and later Salvadoran, population. Today gentrification is attracting richer and whiter residents, as well as amenities like the farmers' market to serve them. Race is a complex topic to address, because its very existence is contentious. Race can dramatically shape the fortunes of people in modern societies despite the lack of a solid biological basis for what appears to be a biological concept. We can define race as a biologically distinct sub-group or sub-species within the human species. By this definition, the answer to the question posed in the heading for this section -- "does race exist?" -- is: biologically no, socially yes. When we say "biologically no," what we mean is that Homo sapiens cannot be divided into sub-groups on a biological basis (Marks 2006). Many other species can be divided into races. That is, there are sub-populations within the species for which members have more in common with each other than they do with members of the species from outside the sub-group. However, this is not the case for humans. Figure 1: Skin color of native populations. It is certainly true that Homo sapiens contains a great deal of genetic diversity. The point, however, is that this genetic diversity does not fall into distinct sub-groups. Consider, for example, the distribution of skin color -- one of the key features we use to identify someone's race -- and another genetic characteristic, blood types (Figures 1 and 2). While there is a great deal of variation in blood types and skin color around the world, both of these traits change gradually over space rather than having abrupt boundaries at the dividing lines between races. Furthermore, the distribution of blood types does not bear much resemblance to the distribution of skin colors. If there were distinct biological subdivisions of our species, different genetic traits like skin color and blood type would cluster in the same way. Figure 2: Prevalence of Type A blood in native populations. Apparent genetic differences may actually be the result of social factors. For example, in the United States it's common to think of sickle-cell anemia as a disease that affects black people but not white people. And for the populations of people living in the US at the present, that's mostly true. However, the distribution of sickle-cell anemia is actually correlated with regions that historically had high rates of malaria, since it is a side effect of a gene that confers resistance to malaria. But the historic distribution of malaria covers some areas (such as the Mediterranean) that we would consider "white," and avoids some areas (like southern Africa) that we would consider "black." The fact that sickle-cell anemia is a black disease in the US is due to this country having been populated mostly by white people from low-malaria regions like Britain, and black people from high-malaria regions like West Africa. Had the US been populated by fewer Brits and Ghanaians, and more Greeks and Zulus, we might be talking about how sickle-cell anemia is a white disease (Adelman 2003). But the fact that there is no biological basis for dividing people into races doesn't mean we can simply ignore race and expect it to go away. We say "socially yes" to the question "is race real?" because societies have put great emphasis on classifying people into races. What race you see yourself as belonging to, and what race others treat you as belonging to, will have a significant impact on your life. So race is socially real because people are treated as if they were part of biologically distinct groups. In the US today, "ethnicity" is often used as a euphemism for "race," or for sub-groups that aren't considered real races. There is no technical definition for ethnicity among social scientists, but the term is typically used to indicate groupings of people that have three characteristics: 1) a shared culture, 2) an alleged shared biological ancestry, and 3) a shared “homeland” or alleged origin place. Since race is a social, rather than biological, concept, we can think of races as a type of ethnicity that emphasizes the alleged shared biological ancestry more than the other two components. Because ethnicity has such strong ties to the idea of a homeland, it is frequently invoked in struggles over which group of people has the right to occupy a particular place and use its resources. We can see this for example in the way that research about the original population of the Americas has gotten drawn into political battles. On the one hand, many Native Americans worry that archaeological and genetic research will reinforce the idea that they are just another immigrant group, rather than having sprung directly from the Earth, and thereby undermine their claim to special rights to the land, fishing and hunting rights, etc. (Deloria 2003). Opponents of Native rights to control and use the land frequently try to call Natives' authenticity into question by suggesting that they have assimilated too much into mainstream American culture (Nesper and Schlender 2007). Figure 3: US Census definitions of races. Map shows what race you would be considered by the US Census if your ancestors were native to that place (note that the census allows people to be of more than one race). Race is an inherently geographical concept. A person's racial membership ultimately comes down to where in the world their ancestors came from. Figure 3 shows the current official racial definitions used by the US Census. 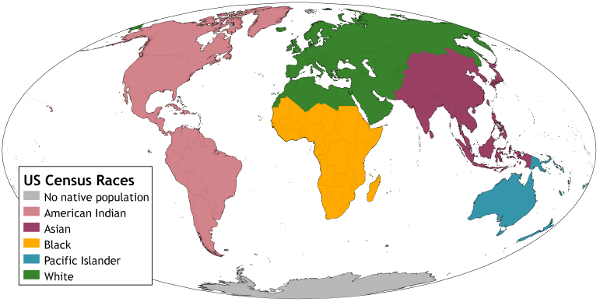 This geographical scheme is the product of various historical, social, and political processes. The census attempted to summarize how the races are socially defined in the contemporary US -- though any such summary is necessarily imperfect, since there is no biological reality to determine who is right in cases of conflict (US Census 2001). For example, advocacy groups for people from Middle Eastern countries have been pushing to have a new category added to the census for them, since they experience racial discrimination yet are considered to be part of the dominant "white" group by the census (Blake 2010). The handling of the category of Hispanic or Latino is also a source of controversy. 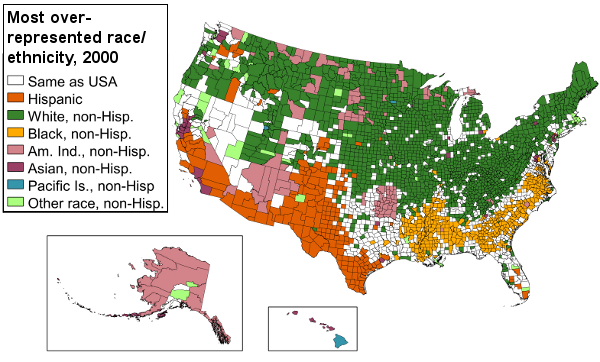 In the 2000 and 2010 censuses, respondents were asked to choose one or more of the Census's five basic race categories (American Indian and Alaska Native, Asian, Black or African American, Native Hawaiian and Other Pacific Islander, and White), then in a separate question to indicate whether they are Hispanic or not. This scheme works well for someone who, for example, is descended from African slaves brought to the Dominican Republic, and who would therefore think of themselves as racially black but culturally Latino. But for other people, such as many Mexican-Americans, "Latino" is their racial identity, and it feels wrong to have to mark themselves as racially part of one or more of the five race categories (Cordova 2010). Geographers using Census data often put all Hispanics in a separate category and compare them to non-Hispanic members of the five official races, effectively treating Hispanic as a race. In the US context, the accepted term for people who are members of races other than white is "people of color." Please be careful not to confuse this with the very similar sounding term "colored people." "Colored people" is likely to cause offense, as it is an outdated term associated with the era of segregation. The concept of race was originally invented to facilitate social control in Europe's colonies (Sundberg 2008). Colonial rulers needed a way to clearly establish the status and roles of the different populations that were coming together in the new American possessions -- rulers, managers, and free settlers from Europe; native people from whom the land was being taken; and slaves imported from Africa. The solution that emerged was to define each group as fundamentally biologically distinct, and ranked on a hierarchy from most animal-like to most advanced. This cemented the rulers' right to rule (since they were the most highly developed race of humans) and drove a wedge between groups such as poor whites and blacks that might otherwise have united to oppose the ruling classes. The discipline of geography was deeply involved in the use of race ideas to justify colonialism (Kobayashi 2003). Geographers were employed to define which people were "really" which race, and to determine the environmental causes of racial superiority or inferiority. Starting in the 1930s, biologists, anthropologists, and geographers began to make headway in debunking the idea of biological race. Unfortunately, the idea of race was deeply ingrained in society by that point. Prejudice (conscious or unconscious), stereotypes, discrimination, and their legacies (in things like poor health and poverty) are too prevalent. It is naive to imagine that we could just ignore race and hope it goes away. Because they have only social, not biological, reality, the boundaries of racial categories have shifted over time. For example, Irish and Italian people were long considered to be of a different race than English, German, or Scandinavian people. This helped to justify British colonialism in Ireland and discrimination against Irish and Italian immigrants in the US. Over time, however, the borders of the "white" category were widened to accept Irish, southern Europeans, eastern Europeans, and European Jews (Washington 2005). Figure 4: Racial/ethnic makeup of the United States by county, 2000. Map shows racial/ethnic groups that are overrepresented in that county compared to the nation as a whole. Counties shown in white have all racial/ethnic groups in similar proportions to the country as a whole. An overrepresented group does not necessarily constitute a majority of the county. Racial and ethnic groups are distributed unevenly across the available landscape. We see clustering of members of a certain race here, and exclusion of them there. Figure 4 shows the spatial distribution of several of the major racial groups in the United States today. This map shows the traces of the country's political and economic history. We can see, for example, how Native Americans in the east were largely killed or forced to move westward. Black people make up higher proportions of the population in the South (where their ancestors were brought as slaves) and in the cities of the North (where they moved in search of industrial work in the early 1900s). The remainder of this chapter will focus on how racial and ethnic groups are distributed at the city or metropolitan area scale. At this scale, several notable processes tend to produce and maintain residential segregation by race. In this context, residential segregation refers to any lack of intermixing of people of different races in the same neighborhoods (Iceland et al. 2002). Figure 5 shows the distribution of Latinos in St. Louis, MO and Newark, NJ. These two metro areas were among the least and most segregated, respectively, in the 2000 Census. The causes of residential segregation are a complex mix of private and public, and of conscious discrimination, unconscious discrimination, and unintended side-effects of surficially race-neutral policies. Affinity between people with similar ways of life is the most politically innocent reason for segregation. Simply put, people like living around other people who live the same way. And when a large number of people with a similar lifestyle live together, they can support the amenities and businesses that they need -- such as stores and restaurants selling kosher food in Orthodox Jewish neighborhoods, or churches offering services in Spanish in areas with large Latino immigrant populations. Clustering together can also help racial or ethnic groups that face large amounts of prejudice to find refuge and solidarity. Instead of being isolated among a hostile population, your neighbors can form a support network as you struggle to resist discrimination and get ahead in a hostile world. 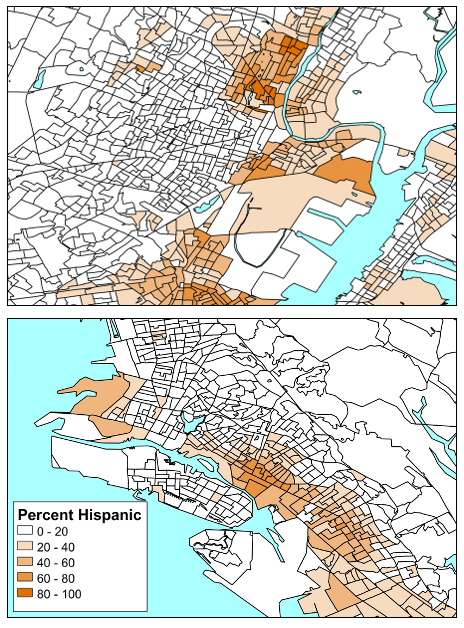 Figure 5: Distribution of Hispanic or Latino population in Newark, NJ (top) and Oakland, CA (bottom), 2000. Newark ranked as one of the most segregated cities for Hispanics in 2000, while Oakland was one of the least segregated. Market forces play a significant role. Different racial groups tend to occupy different rungs on the economic ladder within society. This will produce differing levels of ability to afford to live in particular locations. As the economic status of different groups shifts (e.g. new immigrant groups moving up from the lowest-paid jobs to more comfortable livelihoods), the racial composition of a neighborhood may shift. White flight is a specific manifestation of market forces (Pulido 2000). The more desirable, and less affordable, neighborhoods to which more privileged residents were able to move are typically located in suburban areas around the edges of the metro area. As these people moved out, they left behind neighborhoods that were mostly poor and people of color. Race could often play a role in motivating this movement. In some cases, white residents had a direct prejudice against living next to people of color. For others, the cultural association of people of color with bad neighborhoods (see our discussion of the "inner city" as a symbolic landscape) led them to perceive a racially diverse neighborhood as more dangerous or economically depressed than it really is. And even if neither of those issues applies to you, you might still be worried that other people won't want to live in your neighborhood for those reasons, lowering the value of your home. Gentrification occurs when higher-class, usually white, people move back into neighborhoods occupied by poor people of color (Wyly and Hammel 2004). These newcomers typically fail to form social ties with the existing community. Their greater income pushes up rents, and makes land more attractive for developers to buy up and convert into higher-class housing. New types of stores catering to the tastes (and purchasing power) of the newcomers enter the neighborhood, and out-compete existing stores. Ultimately, the old residents find themselves unable to afford to stay in that place, and therefore they will be forced out into new neighborhoods. These new neighborhoods may be less accessible to transportation routes, farther from jobs, and lacking amenities like stores and restaurants. Public service provision is often skewed by the racial makeup of the areas served (Bolin et al. 2005). Neighborhoods of color may get less water and sewer infrastructure, may be passed over or even directly sacrificed to provide transit and roads to richer and whiter neighborhoods, and may receive less effective and more abusive police protection. This may be due to direct (conscious or unconscious) racial prejudice. Or it may be a side-effect of other forces, as when white flight undermines a city's tax base and thus makes it harder to fund services. Poor provision of public services then reinforces the undesirability of the neighborhood that underlies market-based segregation. Figure 6: Gentrification in Pittsburgh. 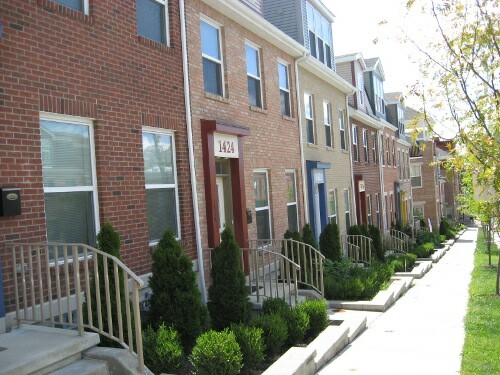 These newly renovated homes are located in the gentrifying Central Northside neighborhood. The census tract went from 52% white to 56% white between 2000 and 2010. Redlining is the practice of banks and real estate agents preventing people of certain races from getting housing in certain areas (Dedman 1989). The name comes from the practice -- back in the days when it was legal -- of drawing literal red lines on city maps to define where houses would be reserved for white residents. Redlining was declared illegal in the US in 1968. But studies have shown continuing informal, and in most cases probably unconscious, discrimination against people of color in home purchases and mortgages. Luckily this form of discrimination, while still significant, appears to be declining over the years (Turner et al. 2002). Violence has long played a major part in establishing the spatial pattern of racial residence in US cities (Washington 2005). Nearly every city in the US is built on land that was violently taken from native people. Following the building of the city, people moving into the "wrong" neighborhood could face harassment, destruction of their property, and physical attacks. Incidents of racist violence have become part of the collective memory of people of color, shaping which areas they understand to be safe to visit and live in (Johnson and Bowker 2004). Violence among people of color, such as that committed by gangs, also plays a role in maintaining residential segregation. Gangs are a social structure that arose in response to residential segregation and limitation of opportunities for poor urban people of color, but gang violence then serves as a reason to perpetuate segregation and blame its victims for their own plight (Anderson 2000). Legal segregation is placed last here because it is the most obvious way that residential segregation could occur, but its effects may be subtle in the US and similar countries today since segregation laws were struck down or repealed in the mid-20th century (Washington 2005). Cities and towns around the country once formally barred people of certain races from living in certain areas. The legacy of this legal segregation continues today as the processes listed above continue to reinforce longstanding residential patterns. Adelman, Larry. 2003. Race and gene studies: what difference makes a difference? in Race -- The Power of an Illusion. California Newsreel/PBS. Anderson, Elijah. 2000. The Code of the Street: Decency, Violence, and the Moral Life of the Inner City. New York: W.W. Norton and Co.
Biasutti, Renato. 1959. Le Razze e i Popoli della Terra: Volume Primo -- Razze, Popoli e Culture. Turin: Unione Tipografico-Editrice Torinese. Blake, John. 2010. Arab- and Persian-American campaign: 'check it right' on census. CNN, May 14. Bolin, Bob, Sara Grineski, and Timothy W. Collins. 2005. The geography of despair: environmental racism and the making of South Phoenix, Arizona, USA. Human Ecology Review 12 (2): 156-168. Cordova, Randy. 2010. Some Hispanics puzzle over race question on census form. The Arizona Republic, March 23. Dedman, Bill. 1989. The color of money. The Atlanta Journal-Constitution, May 1-4. Deloria, Vine, Jr. 2003. God is Red: A Native View of Religion. Golden, CO: Fulcrum Publishing. Iceland, John, Daniel H. Weinberg, and Erika Steinmetz. 2002. Racial and Ethnic Residential Segregation in the United States: 1980-2000. Washington DC: U.S. Census Bureau. Johnson, Cassandra Y., and J. M. Bowker. 2004. African-American wildland memories. Environmental Ethics 26: 57-75. Kobayashi, Audrey. 2003. The construction of geographical knowledge -- racialization, spatialization. In Handbook of Cultural Geography, ed. Kay Anderson, Mona Domosh, Steve Pile, and Nigel Thrift, 544-556. Thousand Oaks, CA: Sage. Marks, Jonathan. 2006. The realities of races. In Is Race Real? Social Science Research Council. Mourant, A.E., Ada C. Kopec, and Kazimiera Domaniewska-Sobczak. 1976. The Distribution of the Human Blood Groups and Other Polymorphisms, 2nd ed. Oxford: Oxford University Press. Nesper, Larry, and James H. Schlender. 2007. The politics of cultural revitalization and intertribal resource management: the Great Lakes Indian Fish and Wildlife Commission and the states of Wisconsin, Michigan, and Minnesota. In Native Americans and the Environment: Perspectives on The Ecological Indian, ed. Michael E. Harkin and David Rich Lewis, 277-303. Lincoln, NE: University of Nebraska Press. Pulido, Laura. 2000. Rethinking environmental racism: white privilege and urban development. Annals of the Association of American Geographers 90 (1): 12-40. Sundberg, Juanita. 2008. Placing race in environmental justice research in Latin America. Society and Natural Resources 21 (7): 569-582. Turner, Margery Austin, Stephen L. Ross, George C. Galster, and John Yinger. 2002. Discrimination in Metropolitan Housing Markets: National Results from Phase 1 HDS 2000. Washington DC: The Urban Institute. US Census Bureau. 2001. Questions and answers for Census 2000 data on race. Washington, Sylvia Hood. 2005. Packing Them In: An Archaeology of Environmental Racism in Chicago, 1865-1954. Lanham, MD: Lexington Books. Wyly, Elvin K. and Daniel J. Hammel. 2004. Gentrification, segregation, and discrimination in the American urban system. Environment and Planning A 36: 1215-1241.